I Dun Shot Dice In Tha Donald by Brandon Thompson. Artists showing in the Design District and Fort Worth offer pointed, loud riffs on pop culture, games and the places where history and current affairs intersect. There were several openings at North Texas art galleries on Saturday. The most noteworthy happened at a house venue, where an artist showed his work for the first time. Curated by artist Pierre Krause, Broke Dem Boyz Off— an expression for stoking jealousy in others— is a solo show by newcomer Brandon Thompson. PRP is a tiny house on Fabrication Street where artists, like founding members Krause and Michael Mazurek, keep their studios. They’ve hosted a few openings that are more like family get-togethers. Thompson is from Cedar Hill and studies graphic design at UTA. He has been painting for less than two years. Texas hip-hop from the likes of UGK and DJ Screw roared from speakers on the front porch at PRP as comers found their way to the door. Some attendees were mainstays of the gallery scene; others were Thompson’s family and friends. Many brought young children. In small groups, viewers entered the apparent living room to see the paintings; some stood on the front lawn and mingled. The scene felt familiar, though it was a different crowd at a different type of gallery. PRP is for “weirdos,” Krause says. The name is short for Permanent Research Project. The space invites new circles to art exhibits and provides opportunities for artists you may not see in other galleries. Thompson used to paint on paper, but recently started using canvas. He says he used his bedroom as a studio and worked at a feverish pace, completing most of these paintings in a day. His works are raw and honest with an endearing openness. Constantly suggesting movement, Thompson’s paintings resemble crayon sketches and drawings. The color schemes are vibrant. “Most of my paintings are of things I have always seen in my neighborhood,” Thompson says. But he decided to imagine a different setting when he painted his friends playing craps in the Oval Office for I Dun Shot Dice In Tha Donald. In the center of his paintings is a single oversized die made of wood and painted with Southern references. Rapper Big Moe pours a lean. A Crown Vic sits with huge rims. Thompson named the piece Pawpaw after “a dice game that slaves played,” he says. Broke Dem Boyz Off is now appointment-only. Patrons can direct message Krause on Instagram for more information. It was also a very different scene in Fort Worth, where dozens of exhibits opened for Spring Gallery Night. Many took an enormous bus from show to show. The galleries were packed, most of them had PBR, and people were so polite that they actually held open doors and even apologized after accidentally bumping into others. William Campbell Contemporary Art has Odd Ducks and Other Assorted Tales, an expansive show from Benito Huerta, who is also a professor and curator at UTA. The Law of the Saddle, Linda Blackburn’s colorful Western Saga paintings, are at Artspace111. Mixed-media artists Jesse Sierra Hernandez and Fabiola Valenzuela explore Latinx identity with their new show Out of Focus at Fort Works Art. 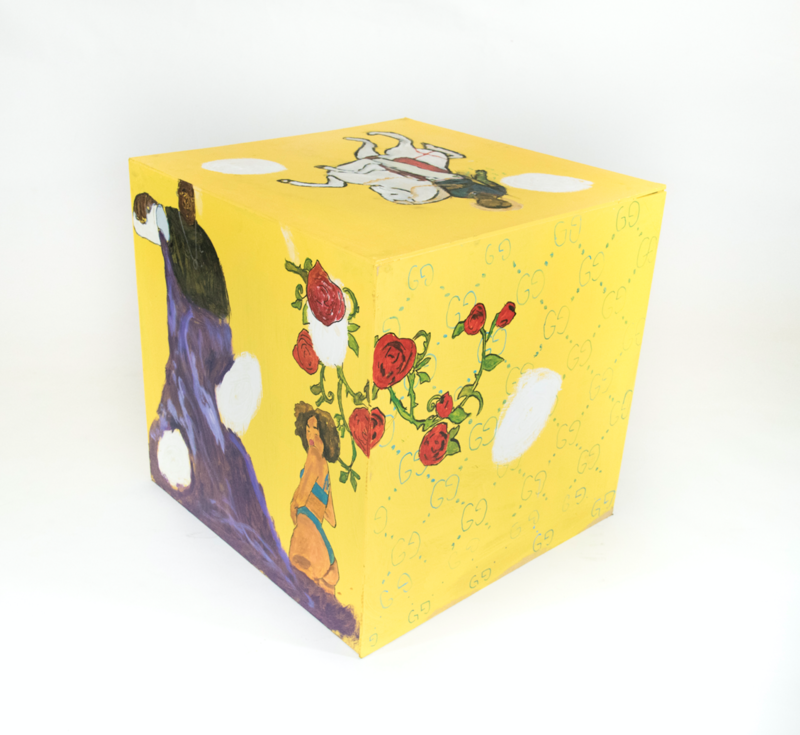 The Sentimental Circus, Adam Palmer’s strange installation pieces and drawings, is also at Fort Works Art. Inspired by playing early video games and watching MTV in the ‘80s as a kid growing up in West Texas, Palmer’s abstract works have loud, vibrant colors. It’s Beginning To Look A Lot Like Freshmas by Adam Palmer. Mixed media. He considers these music videos—along with cheesy horror films from the same decade—as his first introductions to art. 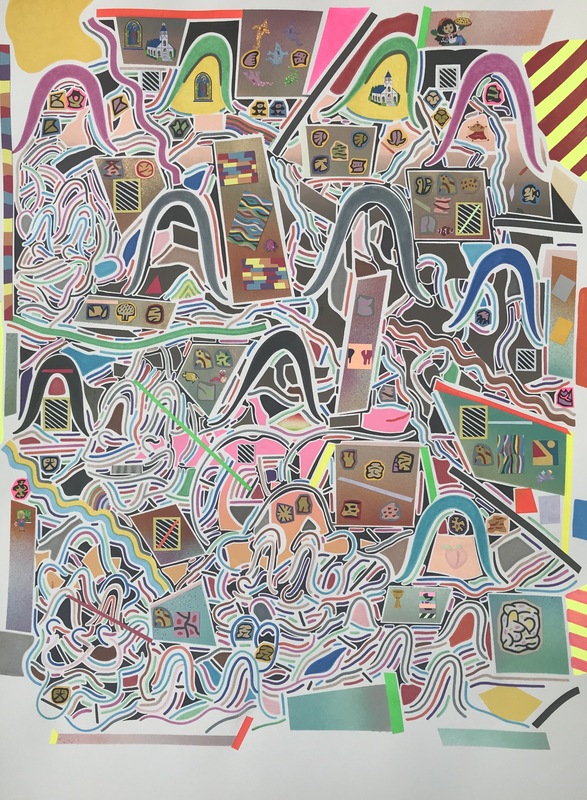 Still mimicking those old color schemes with a mix of drawing, painting, and printmaking, some of Palmer’s larger works resemble maps from old video games like The Legend of Zelda. Built with tiny plastic sculptures, Palmer’s installations hint at his childhood fascination with dinosaurs. But these cheap figures he bought at Dollar Tree have been cut up and reassembled into abstract creatures.